Have you ever wondered how recipes end up in cookbooks or magazines? I really haven't thought about it until I started testing recipes for Robyn Webb. Most times, before a recipe gets published, it gets tested by someone like me: I take careful notes on how long it takes to prepare the ingredients, cook the recipe, how many portions a recipe yields, etc. I also make recommendations on how to improve the recipe. Sometimes, it is a very straightforward process; sometimes, it takes 2 or 3 tries before the final product is deemed good, or trashed. On Monday I tested a Lemony Lentil & Barley soup for Robyn's upcoming vegan cookbook. I could not find barley, and we agreed I could use wheat berries. I thought the dish lacked color, flavor, and wasn't very exciting. I suggested some major changes, and Robyn agreed. 1. Put peppercorns and rosemary sprig into a cheesecloth and tie the corners. 2. In a soup pot bring the vegetable stock, lemon juice and a cheesecloth package to a boil. 3. Add lentils, sweet potatoes, and eggplant. Reduce the heat, cover, and cook for 20 minutes. 4. Meanwhile, in a non-stick skillet heat olive oil, add onions and garlic and cook for 3 minutes. 5. Add carrots, one tablespoon of water, and sea salt and cook for 6 minutes. If you want your carrots completely soft, add about 4 minutes to the cooking time. 6. Once the lentils, sweet potato and eggplant have been cooking for 20 minutes, remove the cheesecloth with peppercorns and rosemary, and add the onion/garlic/carrot mixture. Cover and cook for 5 more minutes. I was so pleased with how this stew came out! 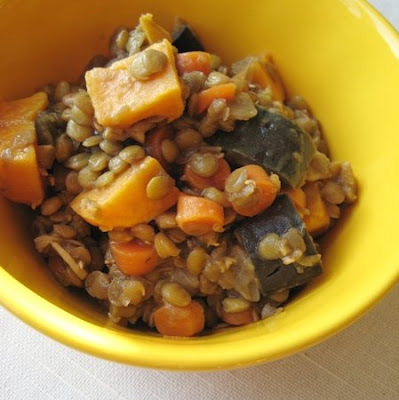 You get the earthy flavors of the lentils, the sweet flavors of sweet potatoes and carrots, and the freshness and sourness of the lemon juice. It's perfect for a winter weather we are having now, but would also be good in the fall. And just think about all the nutrients you are getting! The recipe took about 10 minutes to prep and 35 minutes to cook. It yielded 5.5 cups. I love any lentils dish. That looks great. Hello Olga - this looks so good....lemon huh? We wanted to let you know that we've presented you with an award over on our blog.....you are very deserving!! Looks really delicious. Love the addition of lemon juice! THanks for stopping by my blog and leaving a comment! I will be back to this one. I LOVE to cook. I also love lentils and cook a lot of vegan things (though I'm not even quite a vegetarian). Did you fix this so it's REALLY good? I love flavor. Usually I'm very good at judging a recipe, but I'm just not sure. I think the rosemary ought to really jazz it up. But please tell me if it's a recipe not to miss or just a good recipe. I love lentils, this looks like a nice hearty dish. I like that it has rosemary! yummy! Olga, this is perfect recipe for my husband. He really like lentil, and sweet potato. 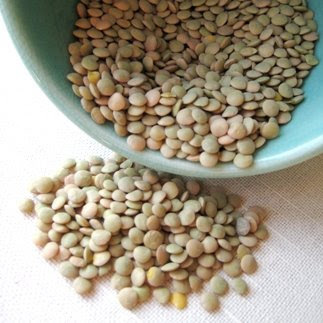 Hi there, can I know what kind of lentils you used for this recipe? I too love lentils, so this sounds like a fantastic way to get a few more into my daily meals. Thanks for sharing! This lentil stew sounds good!